At Chury’s, we bring you a taste of India in condiment form, but not like you’ve known it. 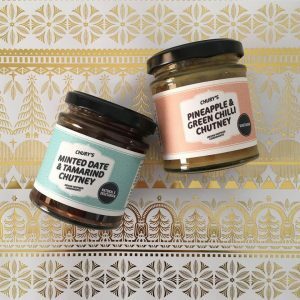 We like to find and develop the best little-known flavour pairings and use them to twist up any meal to go beyond the usual Mango chutney on Curry Night. We’re committed to using unrefined sugars, sourcing quality ingredients and never using preservatives or other nasties. All of our products are vegetarian and do not contain palm oil, so we can sleep soundly at night. Twist up your favourite dishes with Chury’s – enjoy with anything from cheese and crackers, dolloped onto humous with your mezze, alongside a Sunday roast or just savour by the spoon. The possibilities are endless!